Is Earth Really a Planet? What he meant by that was that gas giants dominate our solar system. Jupiter alone is 2.5 times as massive as all the other planets combined...318 times more massive than Earth alone. Jupiter’s gravity well has acted as a kind of vacuum cleaner that has largely swept the solar system clean of dust and wayward asteroids...for which we should be thankful. Jupiter’s gravity even affects the orbits of the other planets, Earth included. This even extends to the asteroid belt. The Kirkwood Gaps—spaces in the belt that make it look like Saturn’s rings—are caused by the gravity of Jupiter and Saturn. And virtually every comet swinging through the solar system has its orbit affected by Jupiter, if not one or more of the other gas giants. 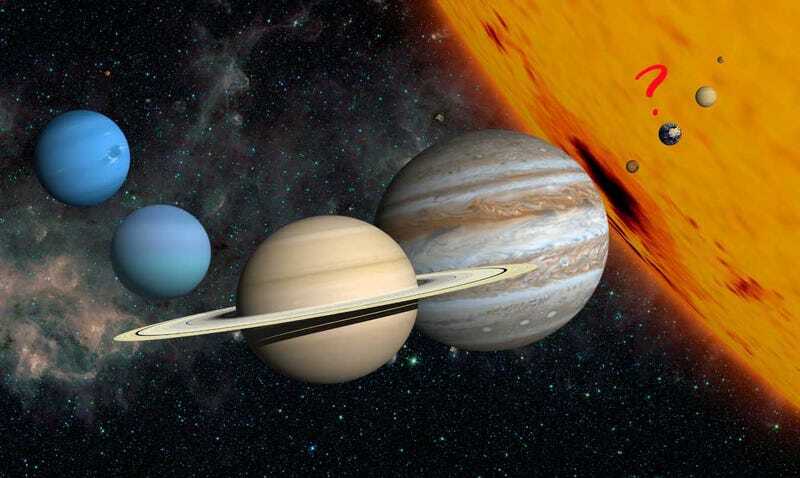 Judging by the planets discovered around other stars, our solar system seems to be typical in being dominated by gas giants, which appear to be ubiquitous among star systems. All of which would seem to suggest that gas giants are the rule. The typical gas giant ranges from being 3 or 4 times larger than Earth to "super-Jupiters" 4000 times more massive than our world. They are composed mainly of gas and liquid, with a small stony/metallic core (“small” being a relative term: the core may actually be far larger than Earth). A large gas giant may even generate more energy than it receives from its star (which is the case with our own Jupiter). On the other hand, a “terrestrial” planet is small, made mostly of stone and metal and is cold (in that it generates little or no heat of its own—-or at least radiates less heat than it receives from the sun). It may or may not have a liquid metallic core. The largest of four such planets in our solar system is Earth—-which is only 1/10th the diameter of Jupiter. How could two objects as radically different in every way as Earth and Jupiter both be “planets?” After all, Earth, Ceres and Pluto are far closer in size, shape and composition than Earth and Jupiter are. In truth, Asimov was right when he said that everything other than the gas giants was debris. The dust, meteoroids, asteroids and rocky “planets” orbiting the sun are in reality nothing more than the residue left over after the creation of the solar system. The gas giants have long since swept up everything else within reach of their gravity. The recent hotly debated IAU definition of “planet” was in reality very subjective. It would appear that it was assumed from the beginning that Earth is a planet and any definition that was devised had to include it. But what if the matter were looked at more objectively? For instance, there is not an iota of confusion regarding where “gas giant” ends and everything else in the solar system begins. There is no gradual shading of gas giant into rocky planet. A body is one or the other. On the other hand, there is a great deal of confusion regarding the rocky bodies. Is Pluto a planet? Is Ceres? In order to maintain Earth's status, all manner of strained convolutions have to be factored into a definition of “planet.” Occam would be rolling in his grave. After all, it does seem a little illogical to call a body 1/6 the size of Earth a "dwarf planet" while saying that both Earth and a body 11 eleven times larger share the label "planet." Looking objectively at the bodies circling the Sun, Earth and Pluto are far more closer in size (and composition) than are Earth and Jupiter. This would pretty much leave Earth, Mercury, Venus and Mars in the lurch. After all, if all four “terrestrial” planets orbiting the sun were to suddenly vanish, Jupiter, Saturn, Uranus and Neptune would hardly know the difference. There is already precedence for this in astronomy. All very large populations of stars are galaxies (which is simplifying the definition). But there are many different kinds of galaxies: irregular, elliptical, spiral, etc. There are even dwarf galaxies. If one can say that M87, Andromeda, and the Magellanic Clouds are all galaxies while at the same time saying that they are a giant elliptical, a spiral and a dwarf irregular, then where is the difficulty is saying that all spherical, non-luminous objects orbiting the sun are planets, while Earth, Jupiter and Eris are examples of specific types of planet? I think we could stand this. After all, we lived through Earth no longer being the center of all creation, and it no longer being the center of the solar system. I think we could live with it being just one among a host of dwarf bodies orbiting a pleasantly middle-aged star, under the protective wing of a quartet of real planets.